The Last Picture Show ? The summer of 17 may well be remembered as the beginning of the end for the cinema industry. Reports of its demise have, of course, been heard before. Television was going to be responsible for its downfall and there was a marked decline with the advent of VHS and the rental market. Since then innovation, franchise releases and aggressive marketing has seen box office takings increase year on year. The the rise of luxury niche cinemas such as the Everyman chain in London have changed the theatre going experience even more, with comfy sofas and drinks services. But as domestic TV screens grew in size, box sets arrived and food delivery has become mainstream, the threats to cinema going are manifold. Perhaps greatest of all is the behaviour of teenagers, who are expected to forego social media in a dark room for two hours or more. Meantime, the talent has been following the money, with even Julia Roberts partaking in TV series in lieu of making feature films. The New Studios have experimented with simultaneous releases online and in theatre (often to qualify for film awards), but the results have been patchy. In the meantime, in the US MoviePass has reduced its membership to just $9.95 allowing members to view a film a day at any cinema, although the US' largest chain, AMC is demurring and may pull out from the scheme. Of course, cinemas make money in other ways. Popcorn has the greatest gross profit margins of almost any product on sale anywhere. 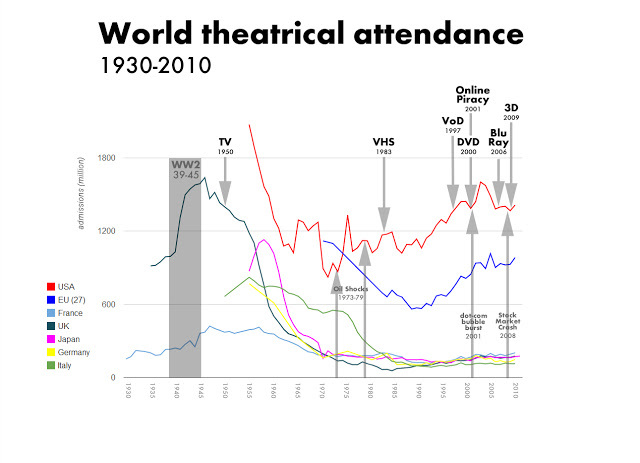 But theatrical cinemas need critical mass to sell enough popcorn to thrive.